The Boys' dress shirts have a left front tab, a double yoke, a collar with a collar stand, a patch pocket and a shirt-tail hemline. 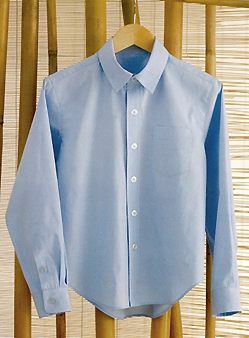 View A has long sleeves with cuffs and sleeve plackets. View B has short hemmed sleeves. 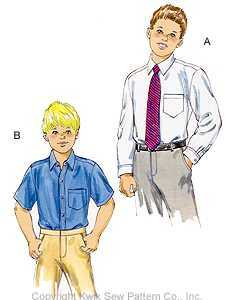 The Boys' Shirts are designed for lightweight woven fabrics. We suggest cotton, cotton types, oxford cloth, broadcloth or chambray. Boy's sizes 4-7 included in this pattern.